Our vinyl material is of the highest quality used in the backdrop market. We use only the best quality laminated vinyl banner material that provides extremely high print quality mixed with incredible durability. The super-smooth surface renders high resolution print images with crisp lines and vibrant colors that pop. Vinyl is tear proof, water proof and can be used outdoors. Vinyl backdrops can double as floordrops with no worries of scuffing or tearing. Poly paper is a lightweight synthetic material that is both water and tear-resistant. While not as heavy as our vinyl backdrops, poly paper can be used many times without incurring damage. Poly paper offers incredible print quality with sharp lines and vibrant colors. This material is not recommended to be used as a floordrop. 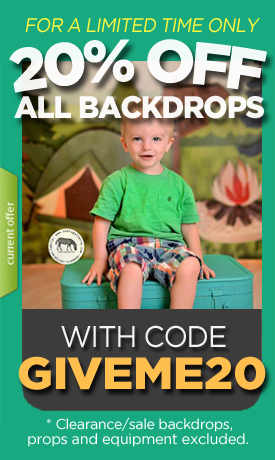 Canvas backdrops are printed on the same material used for canvas art prints. Our canvas is a poly/cotton blend that is specially formulated for high print quality and long term print durability. The slight texture of our canvas backdrops lend to a warm, luxurious feel. Be the first to receive special offers by signing up for our email newsletter!